No matter how you ring in the new year, please have a safe & healthy 2008! I know 1934's Hide-Out has a bunch of fans - whenever it's on TCM I can see the traffic come to the site. Anyway, here's a clip from the film, courtesy of Maureen O'Sullivan, or at least her modern-day, Web 2.0 MySpace spirit. 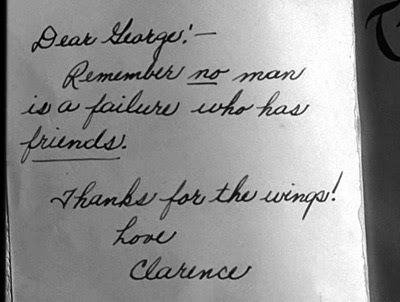 I never thought I'd say It's a Wonderful Life and The Sins of the Children in the same breath. Last week, Movie Morlocks posted an interesting comparison of the two films, noting before IAWL, "...there was another terrifically sentimental family drama which featured many of the same elements: a growing town’s building and loan, missing money, a mortgage come due, immigrants, a Christmas Eve setting, and a father that sacrifices his pursuit of financial success for others..."
Sins is far from one of my favorite Bob films, but oddly enough, it is one of his few films on DVD. It has come to the attention of this blogger that some folks are getting George Montgomery and Robert Montgomery confused. So, in a public service effort to help, below are some key facts to consider when asking yourself "George or Robert?" Pop quiz: can you tell who's who below? For you noir fans out there, a new book on Raymond Chandler is out titled The Long Embrace: Raymond Chandler and the Woman He Loved by Judith Freeman. Read a brief interview with the author. If you get the chance to read this one, do drop me a comment & let me know what you thought. Another new book that may make it to the library list is Hollywood's Censor: Joseph L. Breen and the Production Code Administration. From TCM's review: "...Breen strove to protect innocent souls from the temptations beckoning from the motion picture screen." I guess I missed that boat. The actor who played Alfred the janitor in the original Miracle on 34th Street, Alvin Greenmann recently played a part in a radio update to the story. 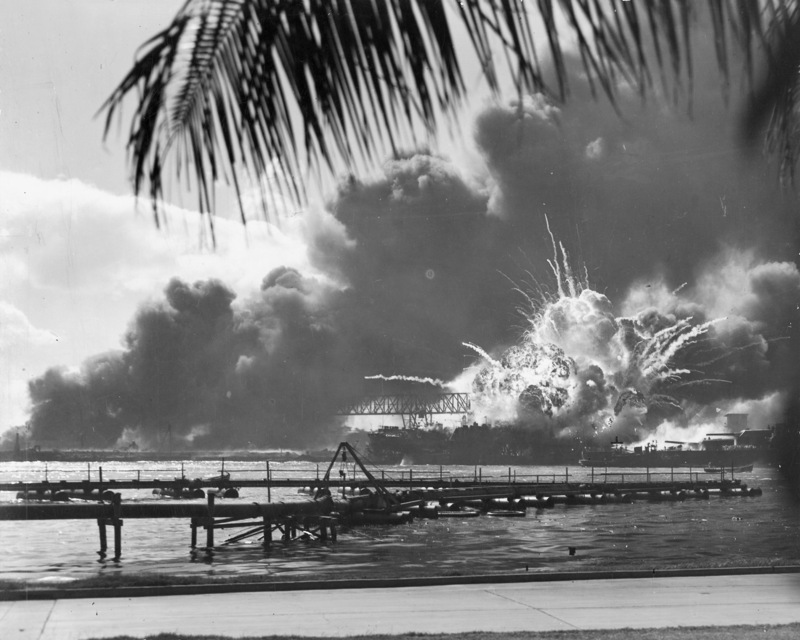 When asked in an interview about watching the film these days, Alvin noted, "I really can't watch it anymore," he says with a laugh. "I mean, you know, that's asking a lot." And a last minute gift idea for that special someone - an autographed photo of Karolyn Grimes. Karolyn played Zuzu in It's a Wonderful Life. Now that would be a conversation piece for your cube at work. And I'll leave you on this totally useless note. PBS had a special on the other night about the rise and fall Rat Pack. Being a fan of old-school Vegas I took the bait & watched it. I have come to the conclusion that Frank Sinatra scares me. In the middle of the war, the aviators & nurses find time for a night on the town somewhere in France. Today's radio feature is the Gulf Screen Guild Theater's version of My Favorite Wife, presented March 23, 1941. Instead of Cary Grant, we get Bob Montgomery as Nick Arden (I'm fine with the substitution...), Irene Dunne as Ellen Arden, and Franklin Pangborn as the hilarious hotel clerk. Interesting how the clerk gets more microphone time than Stephen Burkett's character. The audio is a bit slow and makes the voices sound odd, but you still get the story with no problems. 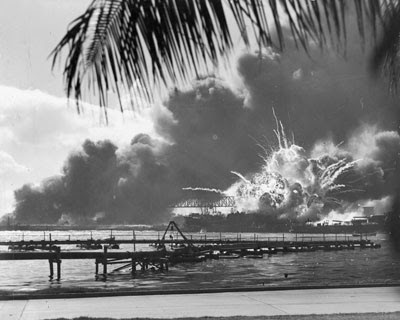 Photo Friday takes a bit of a break today to honor those who lost their lives on December 7, 1941. 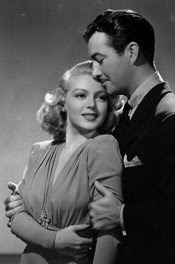 Continuing the video theme this week, today's post is a clip from 1941's Unfinished Business. Here we're treated to a hung-over, disheveled, newlywed Bob, his wife, Irene Dunne, and a way too unappreciated Eugene Pallette. And yes, there will be a quiz on Spanish movie lines after the film. From YouTube: The video is dedicated to the brilliance of Carole Lombard, one of the funniest ladies to ever live, and Robert Montgomery. The music is the 1937 "Powerhouse" by Raymond Scott. All hell breaks loose at the Wetherby home when the man in possession (Robert Montgomery) plays butler (among other things) for the evening. The Man in Possession is a gem of a pre-code and is highly recommended. A bit of variety this month on TCM - a few that haven't appeared on TV in a while. As always, check your local listings for exact time. Photo Friday - My Choice is Camels! Joan Crawford made her own 30-day Camel test – and compared for mildness and flavor. So have many other smokers. Start your own sensible 30-day Camel test today. The ad is from roughly 1951 based on a date on the back of it - another ad, for 7-UP. The magazine is unknown. Today's radio show is a presentation of Noel Coward's We Were Dancing from the Gulf Screen Theater, October 29, 1939. 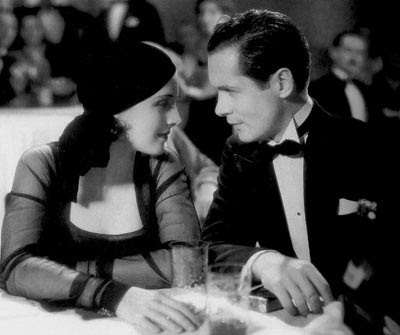 The show's players include Robert Montgomery, Binnie Barnes, Hedda Hopper, and Adolphe Menjou. IMHO, We Were Dancing doesn't take well to radio - it comes across as thin, probably as a product of radio. A good comparison may be watching the 1942 film version of the story with Norma Shearer and Melvyn Douglas, which I've just added to my list. It's a good thing that the rest of the show is entertaining: Binnie & Bob sing a duet, Adolphe's stamp collecting adventures, and the Gulf Question Box. If you're in the question box, and answer a question incorrectly, you get the "opportunity" to do something off-the-wall. Spoiler alert. Binnie bangs on the drums with the band, Adolphe roars like the MGM lion, and Bob reads Shakespeare in a Jimmy Cagney accent. With that, I'll leave you with my favorite line from the story . . . "who's that kissing your wife?" Looking more like a scene from a Hitchcock film, Max (Robert Montgomery) and his father, Florian (C. Aubrey Smith) are just living another day off of a couple of rich women. Now can't we get Private Lives, too? Time for me to watch Shipmates again - for the life of me I can't remember this scene between Dorthy Jordan and Bob! Happiness is a Hitchcock film. Add to that Halloween evening, a live symphony, and clips from some of his most known movies and I'm in seventh heaven. Last night, I had the pleasure of listening to the local symphony pops play Hitchcock snippets as scenes played on a screen above. The music was so sharp and seamless, at times I forgot they were there. The 2 hour event started with the theme to Psycho, sans movie clips. It didn't bother me - this gave you the opportunity to watch the violinists get into the murder scene with their bows. One minute it was movie music, the next was murder by musical instrument - the crowd loved it. The music for To Catch a Thief had to be the least memorable in my mind. 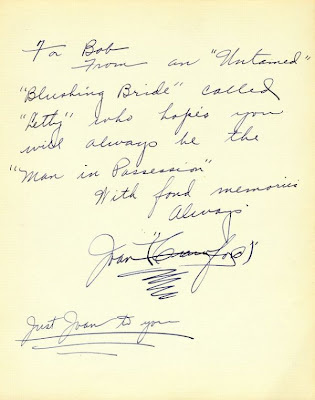 For this film, the beginning credits through Cary Grant meeting Hitch on the bus was shown. I was happy to see some time dedicated to Strangers on a Train, the oldest and only black & white film featured. To start, the credits through the meeting on the train was played. Following, the scene where Guy slips into Bruno's home to kill his father. Next, the tennis match where it flips between Guy playing and Bruno dropping the cigarette lighter down the storm drain. The final scene was the carousel going out of control through the end - the American version of the end. The North By Northwest trailer presented was intermixed with Hitch's home movies and his trademark Funeral March of a Marionette song in the background. Dial M For Murder started with the beginning credits through Mark Halliday arriving on the Queen Mary. That was followed by the murder scene, then ending with everyone catching Tony with the spare key. My personal favorite wasn't the murder itself but the minutes up to it where the murderer and Tony keep looking at their watches, waiting for 11 p.m. - the music turned into the ticking of the clocks. The theme to North By Northwest was hair-raising - very cool if I may say. For that film they presented the beginning credits, the "funny drunk" scene (as they dubbed it), ROT escaping the hospital to the home in the hills, and the chase on Mt. Rushmore through the end. Even though the music may not be as memorable, it'd be great to see his less popular, older films presented in this format! Not a lot of Bob offered up on TCM for November, but they are showing a Joel & Garda mini-marathon. For those who don't know, Joel & Garda Sloane are similar to Nick & Nora Charles in their detective ways, but there's less booze and no dog. Can you say DVD box set? Only in marketing can you have engine performance, oil, movies, and Robert Taylor come together. This particular handout came from Elsmer A. Guse's Standard Oil Dealership in Mayville, WI. Thank you, Elsmer. Hop aboard the rickety merry go round with this Lux Radio Theater presentation of Ride The Pink Horse from Dec. 8, 1947. The film is one of my favorites and this radio version is just as good. Carrying over from the film version is Robert Montgomery as Lucky Gagin, Wanda Hendrix as Pila, and Thomas Gomez as Pancho. And if you think you hear a touch of Fred Flintstone in Frank Hugo's voice, you're not far off. Hugo is played by Alan Reed, voice of the lovable Fred. Some marriage proposals are made over a romantic dinner. In this case, Mary (Madge Evans) busts into Willie's bedroom and proposes right there in this scene from 1932's Lovers Courageous. "If you say another word I'll pop into that bed right now"
TCM.com has joined the social networking bandwagon (aka web 2.0). The site is now accepting images, video, comments, and reviews from visitors for their massive movie database. 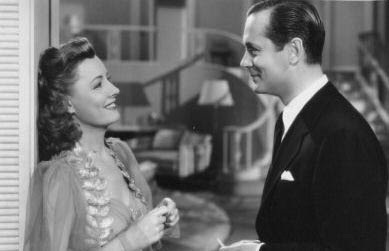 Of note, there's additional content up now for Robert Montgomery: behind-the scenes photos for They Were Expendable and Private Lives, trailers, film clips, and a few misc. photos the size of a postage stamp. I particularly enjoyed the Private Lives pics, but could do without the phantom watermarks. 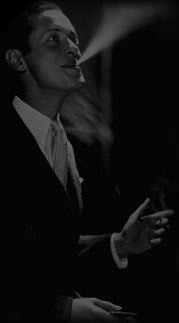 Der Bingle is now on the Internet with a new web site at BingCrosby.com. A beautiful site with some neat audio features. And from the DVD world, word that the Joan Crawford Collection Vol. 2 is coming out in February. As reported on TheDigitalBits.com: "The 5-disc set will include A Woman's Face, Flamingo Road, Sadie McKee, Strange Cargo and Torch Song, along with bonus features set to include new featurettes, radio shows, vintage short subjects, trailers and more." Continuing on the mixed drinks theme this week, today's photo is of Bob & Franchot Tone, from 1935's No More Ladies. Bob seems to be holding a mixer of radioactive material (actually, it was edited for print, but the isotope thing sounds like more fun). Today's radio show is a presentation of The Gulf Screen Guild Theater from January 22, 1939. Can We Forget stars Robert Montgomery, Bette Davis, Basil Rathbone, Louise Beavers, George Murphy as MC, and is directed by Frank Capra. It's the story of loss and a voice from the past. I'll leave the rest of the story to you. Bette is excellent in this story - and it takes a lot for me to say that since I've never been a big fan of hers. The thought of getting a mixed drink from a bottle scares me a bit, but apparently it didn't bother Walter Pidgeon enough for this mid 60s ad for Heublein Cocktails. Here's an interesting one today - a clipping from Spot Magazine, which I'm assuming was something along the lines of a Maxim magazine of the 1940s. Joan Crawford is playing the unsympathetic role of a horribly disfigured woman in Metro-Goldwyn-Mayer’s “A Woman’s Face.” SPOT salutes her because she is a beautiful actress who would rather be an actress than a beauty. The studio hasn’t release pictures of Miss Crawford in character, but we present our conception of how she’ll look as a scarred extortioner. Good news for you OTR fans out there. I've been able to dig up more Robert Montgomery radio shows, which I'll be listing here in the next few weeks. Today's selection is My Client Curley from The Screen Guild Theater, presented February 2, 1946. Bob is a promoter who's client is a dancing caterpillar. I'm not kidding. It's a cute story with a nice change of pace. The storyline is also the premise of Cary Grant's Once Upon a Time. As always, check your local listings for exact start time for your time zone. Nothing against Mr. Jordan, but the last two are always a treat to watch. OK movie and Robert Montgomery fans, I've got a mystery photo for you today - or at least it's a mystery to me. I'm trying to identify the two people sitting on either side of Bob. I picked up the photo with a set of other photos averaging from the 1930-31 time frame. The older woman on the right looks familiar, but I can't come up with a name. Have an idea? Drop me a comment! All three offer the same version of the Screen Guild Theater script, just with different players. Two of the three presentations offer a celebrity voice, which I will not mention here, but is fall-off-the-chair funny when you hear him. I'm partial to the Robert Young version, for obvious reasons, plus Ralph Bellamy as Jeff Custer is a perfect match. Errol Flynn as David...nope, doesn't cut it. You may not want to listen to all three in one sitting - you'll end up with odd dreams of David (or Ann). Danger in the Air . . . Walter Pidgeon and Rita Johnson are the center of a series of hair-raising episodes incidental to the story of Metro-Goldwyn-Mayer's "Nick Carter," an exciting melodrama based on the famous detective of fiction. Pidgeon plays Carter and Miss Johnson is an airplane stewardess, who figures not only in the thrills, but also in a romance with the super-sleuth. Jacques Tourneur is the director and Lucien Hubbard is producing. 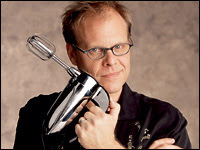 The Food Network's Alton Brown is one of my favorite TV guys. What does this have to do with movies? Well, he's scheduled to be a guest programmer on TCM in November. No word on the movies he's showing, but I hope he has "taste" beyond Breakfast at Tiffany's. A couple of victims of the newspaper/magazine editing world. I've never cared for the floating head fad of the 1930s. I didn't realize how "new" this photo was until I looked up the film title - A Majority of One, 1961. A few highly valuable pages from a Hell's Angels movie program. If you ever made it into Life Magazine, you were hot. Er, uhm, really - I mean popular. In the first issue of the photographic version of Life, November 23, 1936, Hollywood was well represented with an article on the young Robert Taylor. I love this line from the story: "...he has appeared in two highly successful pictures (The Gorgeous Hussy, His Brother's Wife), lost one shoe to a mob of female admirers on Broadway, received more fan mail than anyone else in Hollywood." Just a FYI, I've added 2 more movie pages to the Classic Montgomery web site: Trouble For Two and Three Loves Has Nancy. And It's Not done With Mirrors . . . Robert Young shakes hands with himself. This bit of trick photography was accomplished on the set of "Honolulu," starring Eleanor Powell, in which Young plays a dual role. The picture is a musical dance comedy, directed by Edward Buzzell and produced for Metro-Goldwyn-Mayer by Jack Cummings. If you're unable to locate a copy of Haunted Honeymoon on DVD, head to your local bookstore instead. Haunted Honeymoon is based on Dorothy L. Sayer's 1937 book Busman's Honeymoon. I picked up my copy at a local Half Price Books store. And if you can't get enough of Lord Peter Wimsey, don't worry. I believe there's 11 Sayers' books revolving around him.